I was asked by Bowel Cancer UK, who I’ve supported for many years, if they could use my story to highlight the real impact of NHS staff shortages as part of their End the Capacity Crisis campaign.I offered to do all I could as the increasing demand and the lack of NHS staff to diagnose bowel cancer patients directly impacted my experience being diagnosed with bowel cancer. I truly believe if nothing is done to address these staffing issues, patient lives could be risk. We have a small window of opportunity, with the current development of the NHS 10 year plan and the Government allocating money to the NHS in their Autumn budget, so we must act now. 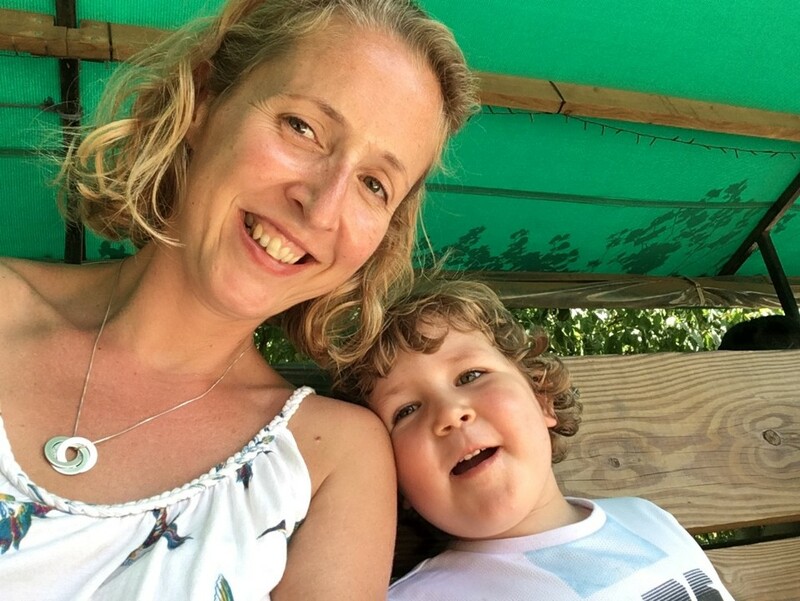 I was diagnosed with stage 3 bowel cancer in February 2017 at the age of 39. After several years going to my GP with various symptoms, I was finally referred for a non-urgent diagnostic test for bowel cancer. I was referred non-urgently because I hadn’t experienced unexplained weight loss, which is one of the five symptoms of bowel cancer, so they assumed it wasn’t a serious bowel condition. I initially waited 2 months for tests, which was then pushed back another month. The waiting time target for non-urgent referrals is to be seen within 6 weeks, so I had already been waiting longer than I should be. By this point I was bleeding when simply standing up so I called the GP and insisted on an urgent appointment. After nearly 3 months of waiting for my initial bowel cancer test, I finally had an endoscopy procedure and, much to everyone’s astonishment, I was diagnosed with stage 3 bowel cancer. Since my diagnosis, I’ve had to stop work, and as I can’t look after my children, who are 1 and 6, my husband has had to take time off work too. If I had been referred sooner for bowel cancer tests and was seen within the waiting time target of 6 weeks, rather than nearly 3 months, perhaps my bowel cancer may have been picked up at an earlier stage when it is easier to treat. I’m not the only one who has experienced delays to being diagnosed with bowel cancer because of waiting too long for key tests. Nearly half of hospitals in England are breaching waiting time targets for these life-saving tests. This means that, so far in 2018, each month around 3,000 people with suspected cancer waited longer than they should for an urgent referral and over 1,700 people waited longer than six weeks for routine bowel cancer tests. 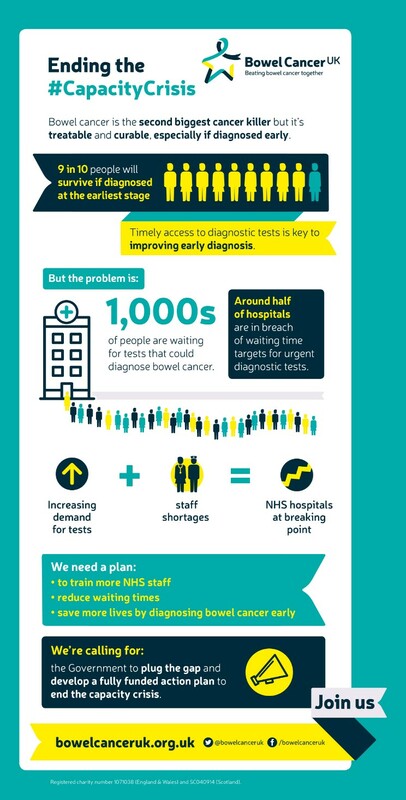 To help stop thousands of patients waiting too long for diagnostic test join me in calling on the Government to plug the gap and develop a fully funded action plan to end the capacity crisis. Knowing symptoms of bowel cancer can save your lives. Find out more.